Laura Victoria | The Goose Is Out! Laura supported The Jackie Oates Band in 2011. Thanks Laura, you were great! We are delighted to have her back with her band in 2014. She also stepped in at short notice when the original support act pulled out, to support Bella Hardy later the same year, and was even better than before if that is possible! Songs of love affairs, shipwrecks, imaginary worlds and cups of tea accompanied by cello playing that veers between moving melancholy airs, punchy rock riffing and slap bass. Originally from Northumberland, Laura first started singing at folk festivals like Rothbury Folk Festival and the Morpeth Gathering. 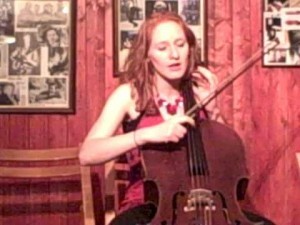 She was a member of Folkestra North directed by Kathryn Tickell before studying the folk degree at Newcastle University. She performs traditional songs, often unaccompanied as well as her own folk pop compositions. She recently released her debut EP ‘Acting Up’ through Cherry Red Records. Froots said “Both quirky and strangely irresistible”. Click here to go to Laura Victoria’s website!